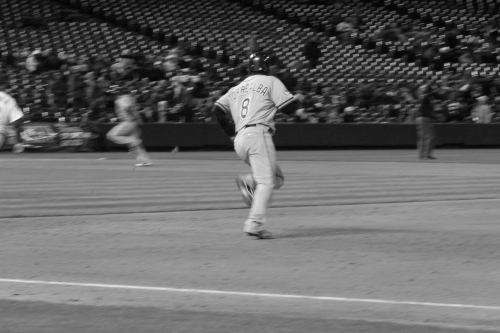 Eight was great, Nine was denied! 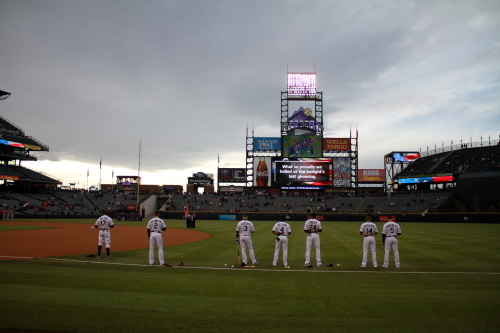 Game 3 of series my 9th of the year at Coors. 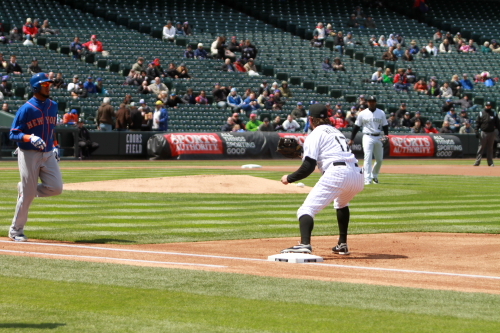 After a cold snowy week this series the weather was pretty nice and this was the best weather day it was about 60 degrees and sun through most of the game it was a great day for baseball. 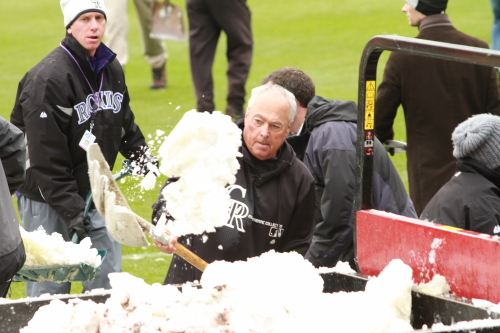 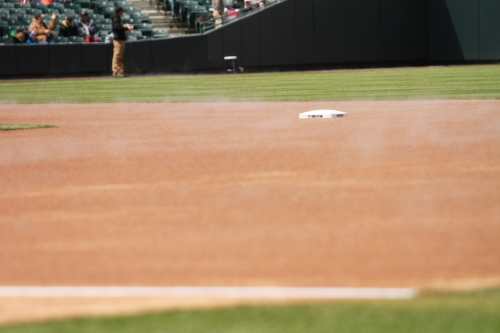 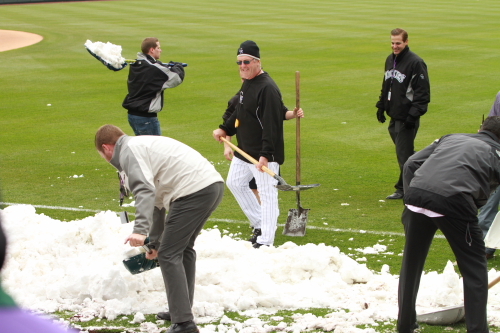 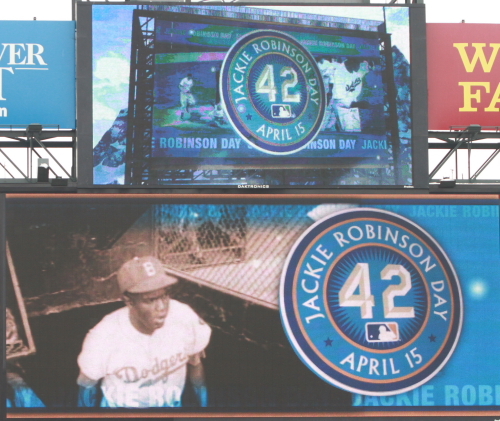 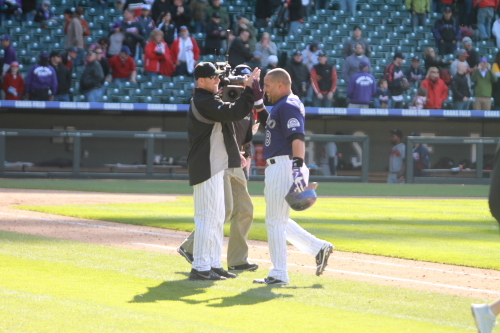 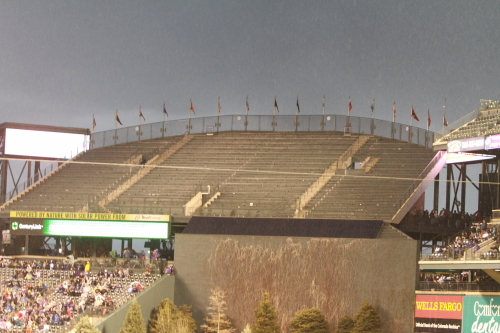 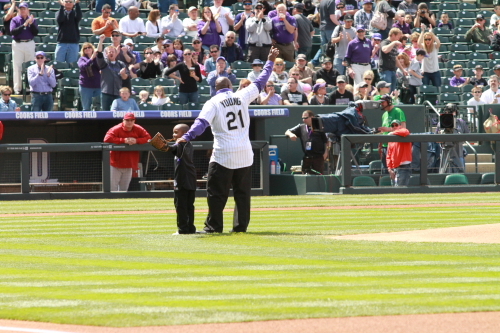 It was also another day to celebrate the 20 Years of Rockies history. 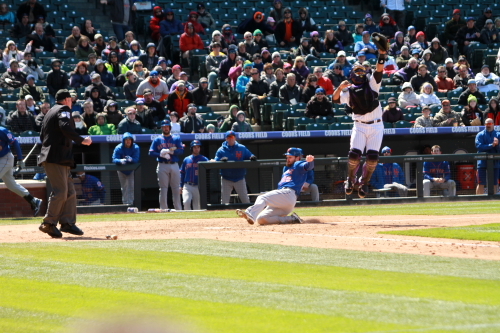 It was Eric Young bobble head day. 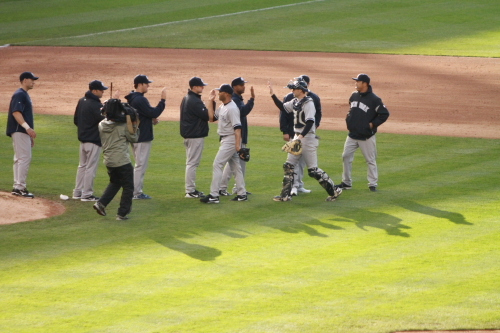 My day started early as I headed to the stadium at about 9:30. 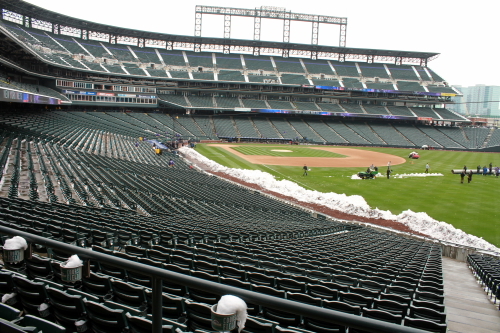 When I first heard that the Sunday games were going to start at 2:10 I was like wow I have an extra hour before I have to get to Coors, yeah that hasn’t happened the 2 Sunday games we have had this year. 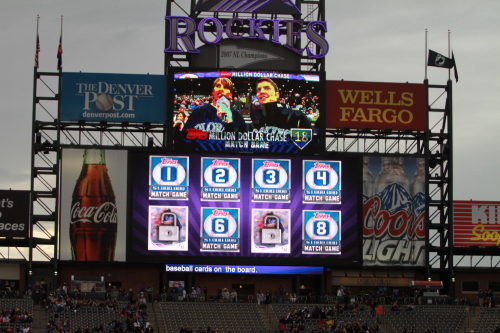 I have been getting there earlier than when the games were at 1:10. 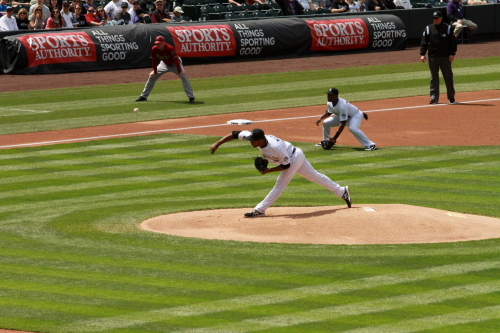 So I headed out to the players entrance to see if I could get any autographs and I got 3 I had an 11X14 print signed by Wilin Rosario, Matt Belise on my team project and a card signed by the Diamondbacks relief pitcher Heath Bell. 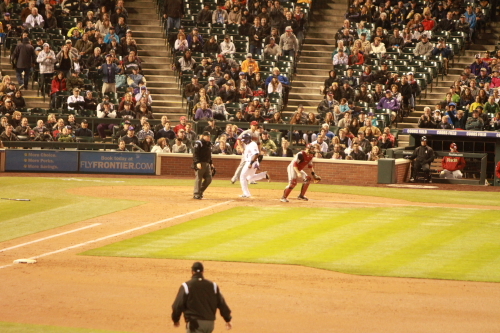 After a while I got online to enter the stadium I went in the E gate and got my Eric Young Bobble head. 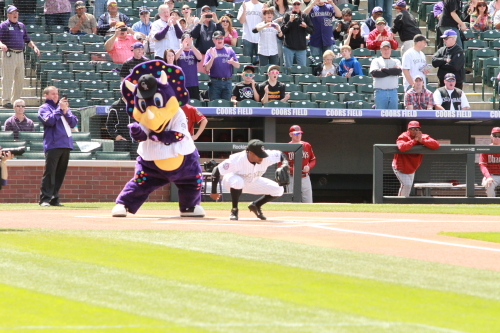 I brought that to my car and headed back in for the Sunday autographs. 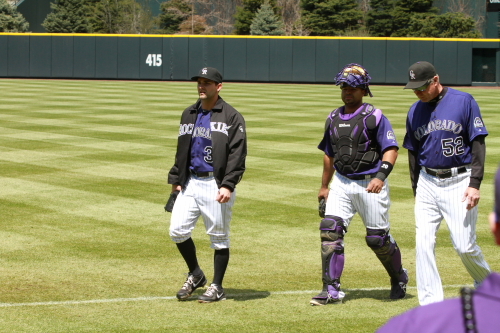 The first line I got into because they were not yet labeled was Adam Ottavino’s line which I had nothing for him to sign so I got on another line which was Reid Brignac’s line and was able to get him to sign my team 16X20. 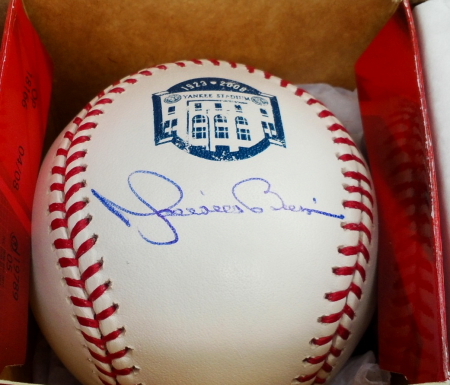 The other 2 signers today were Jon Garland and Rex Brothers. 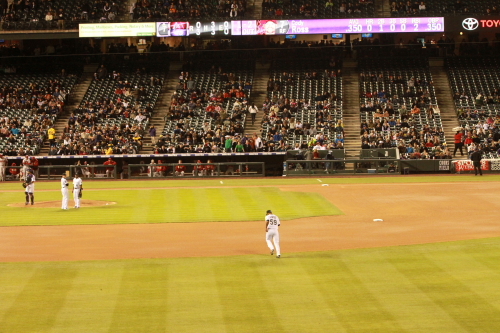 Because of the larger crowd and the give away the lines were long, I did attempt to get on Garlands line because I had a card for him to sign. 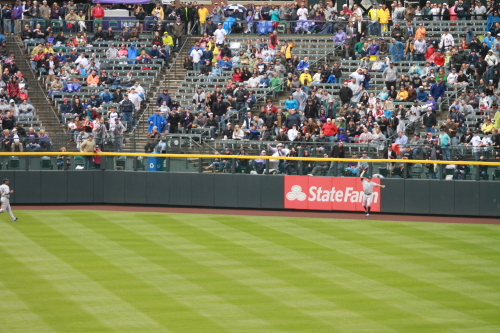 I figured because of the length of the line I would not get his autograph so I just waited to head down to the wall. 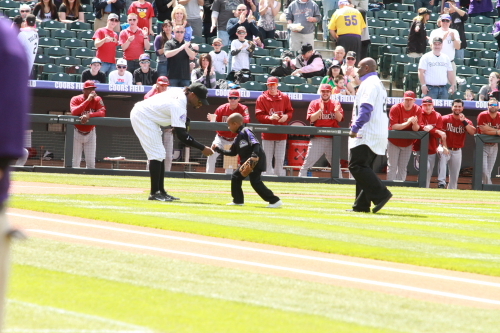 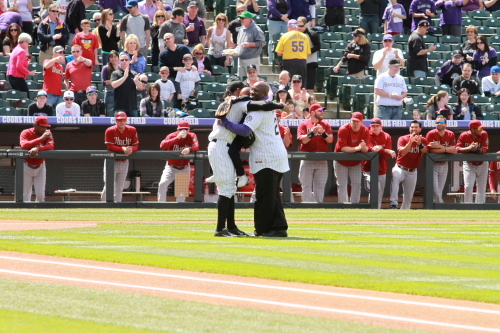 Eric Young was at Coors for his bobble head day and he and his son Dallas came out for the first pitch. 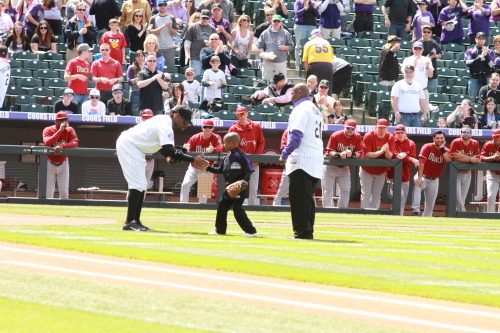 Dallas actually threw out the first pitch. 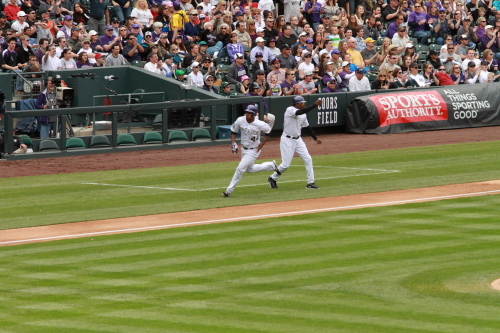 He threw to big brother and Rockies outfielder Eric Young Jr. 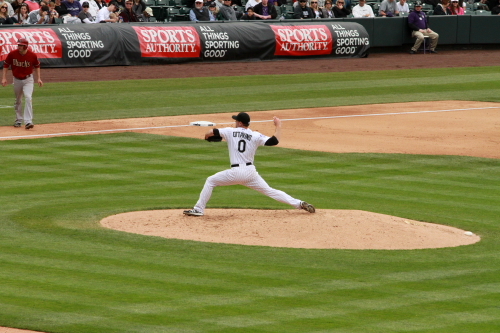 He threw a pretty good pitch. 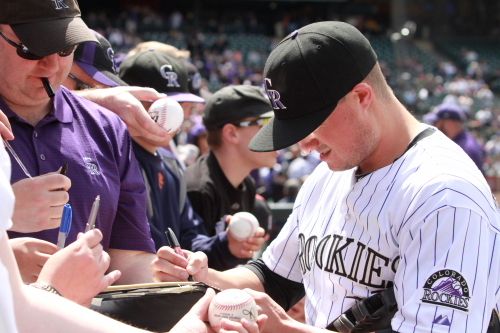 After first pitch Jordan Pacheco came over and signed a few things for us in the crowd. 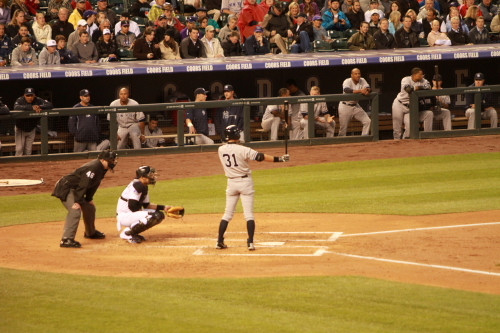 I did not have him sign anything then I only had a 8X10 of a photo I already had a copy signed. 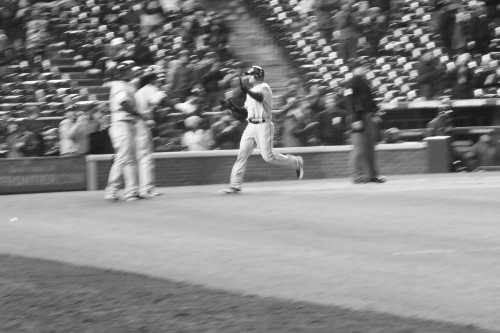 After the game he stopped out back and I had him sign it anyway. 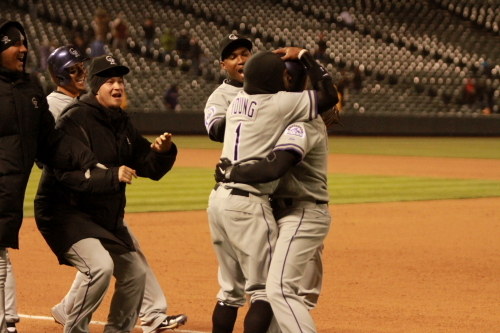 EB makes a special guest appearance in this photo! 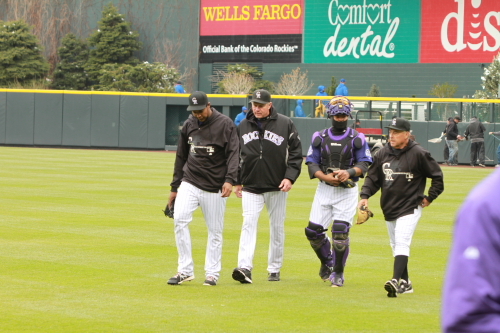 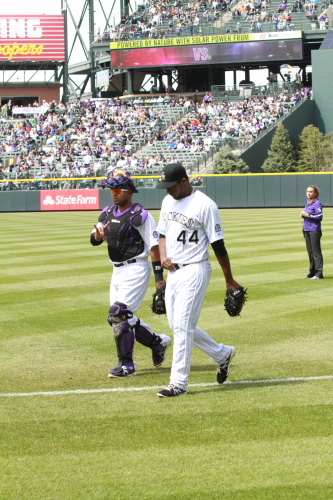 Wilin Rosario and Juan Nicasio head in from the Bullpen for the start. 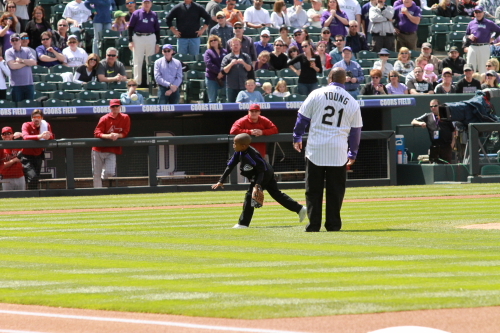 Juan Nicasio throwing the first pitch to the Diamondbacks Geraldo Parra. 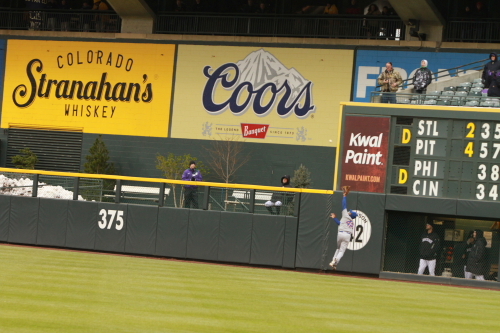 He would fly out to Carlos Gonzalez in left field. 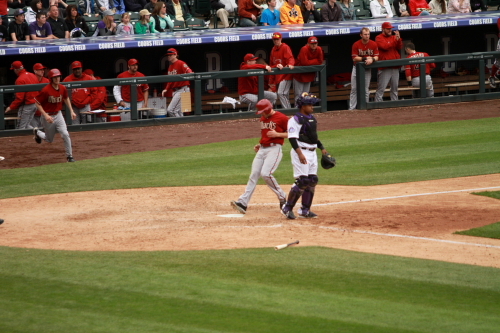 Nicasio would face 4 batters walking Paul Goldschmidt and the others 3 got out. 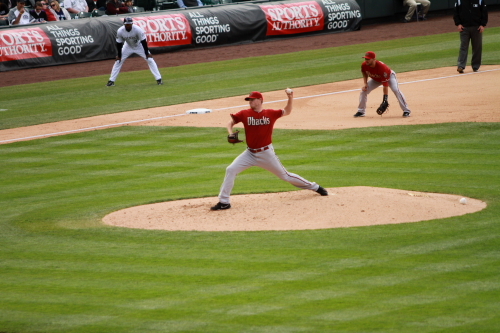 The Diamondbacks starter for this game was Brandon McCarthy. 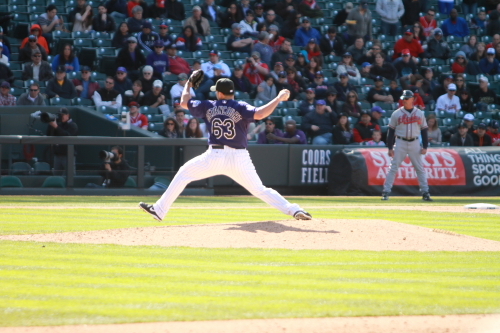 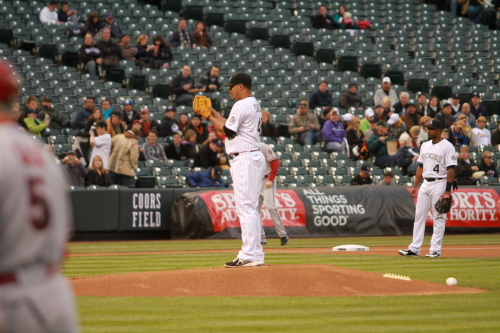 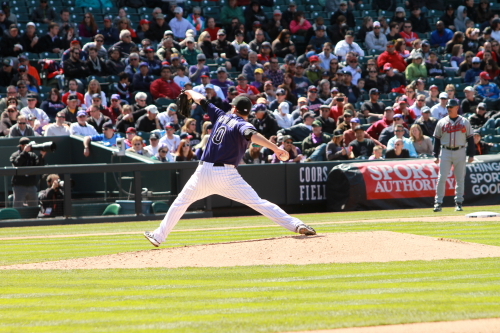 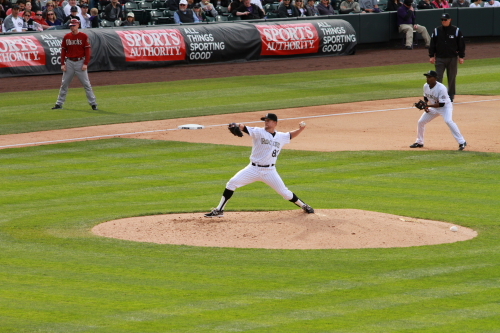 He Sat the first 3 Rockies batters down in the first inning and faced 4 in the 2nd. 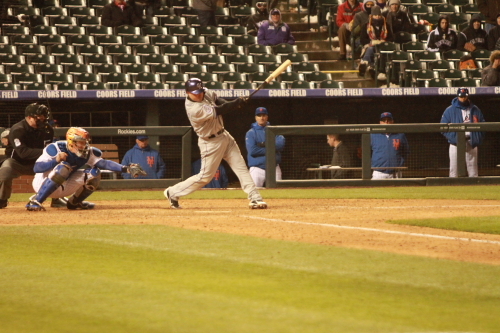 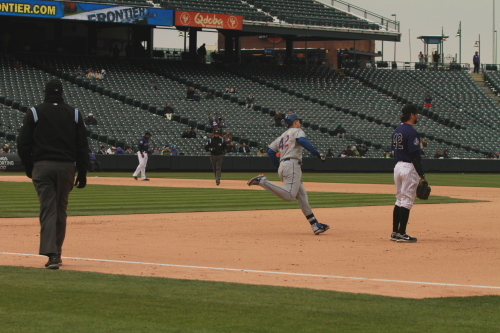 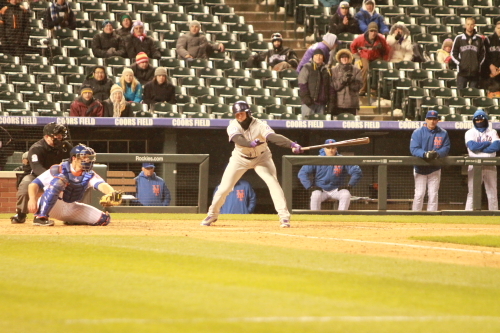 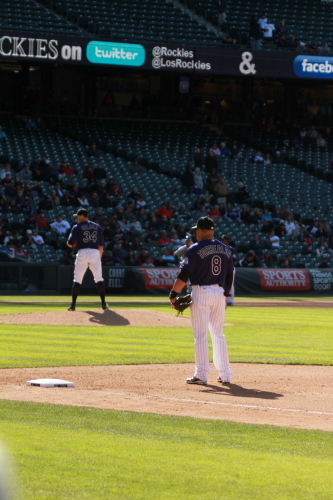 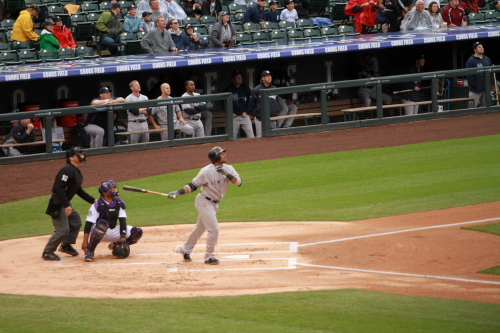 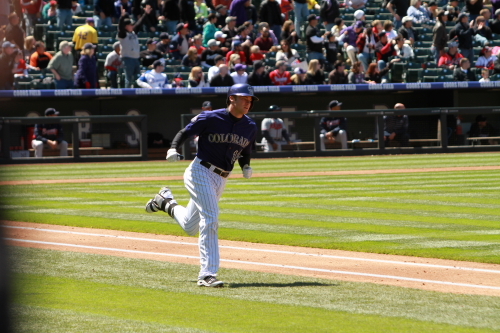 Troy Tulowitzki lead off the 2nd inning with a single but was left on base. 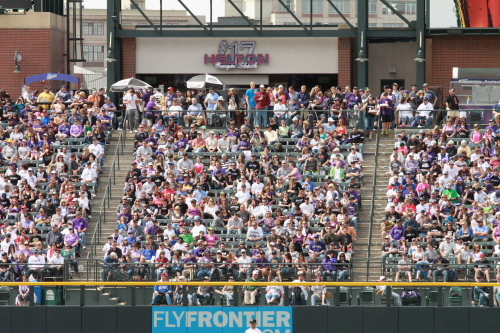 It is time to play find the Ranter in the Pavilions! 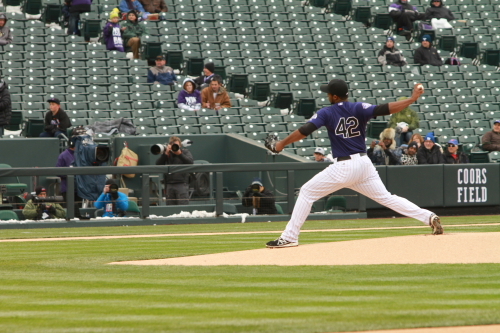 Stu Coles waves Juan Nicasio. 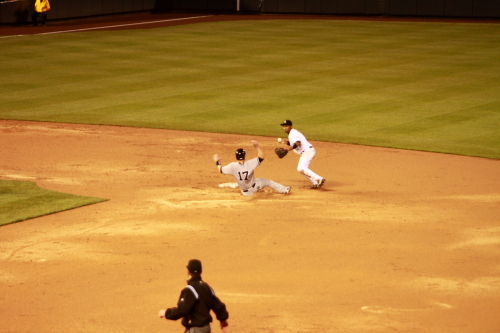 around third on Jordan Pacheco’s double. 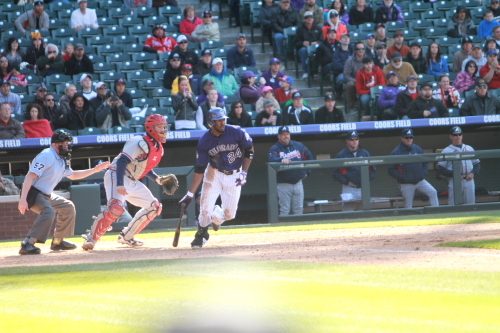 Nicasio getting to home plate. 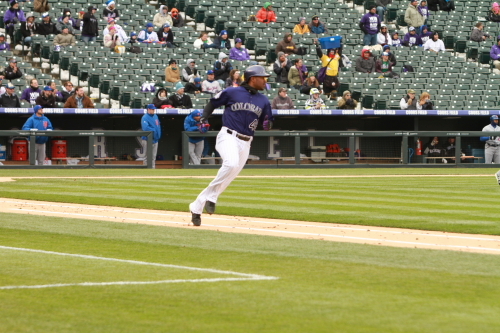 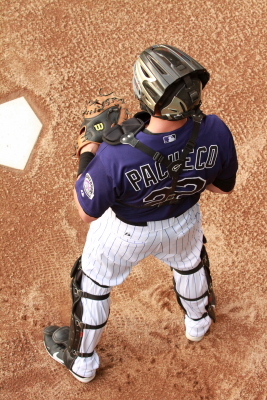 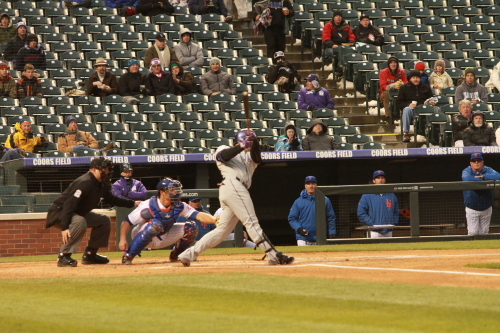 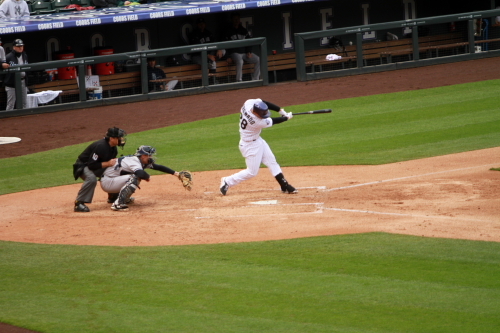 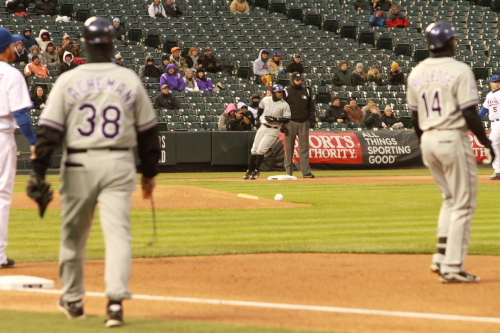 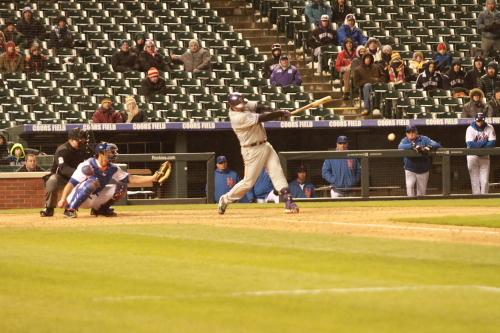 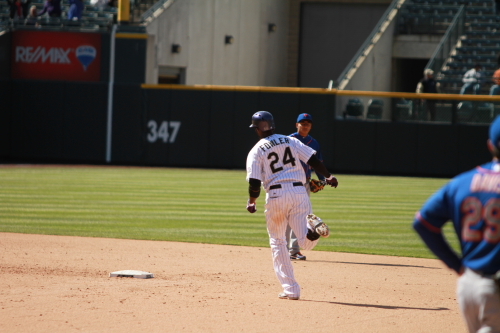 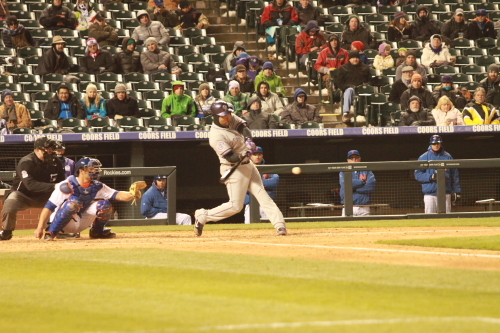 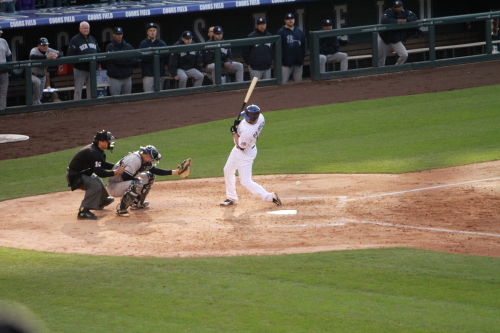 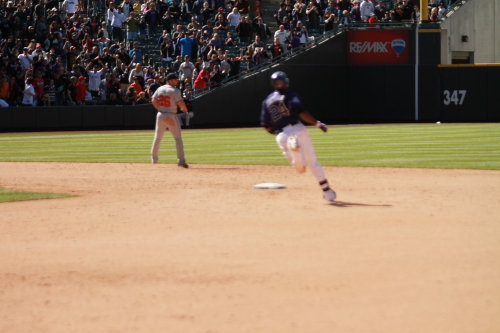 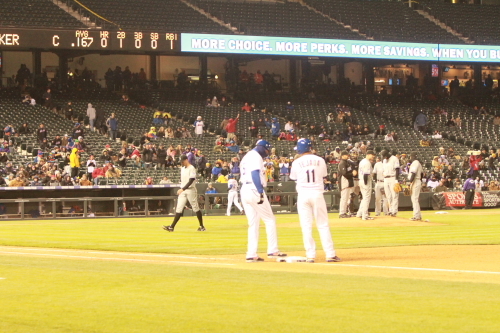 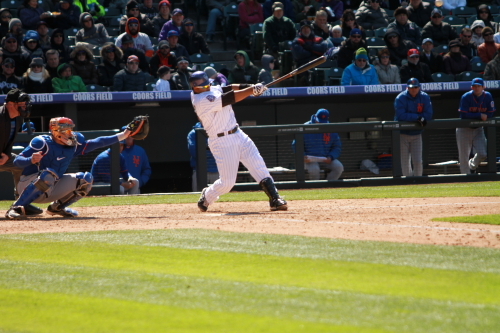 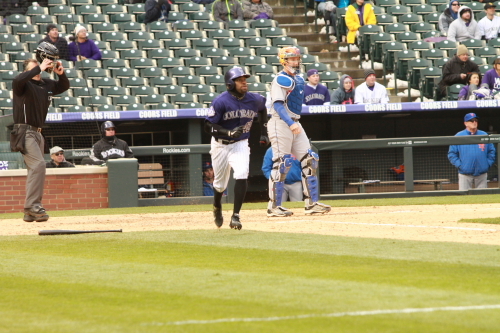 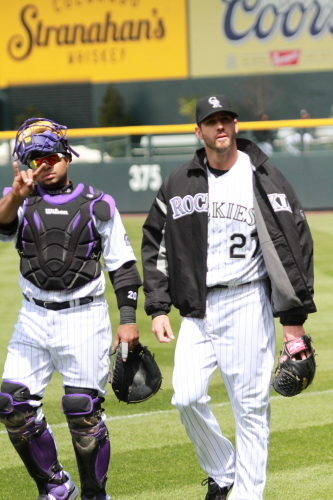 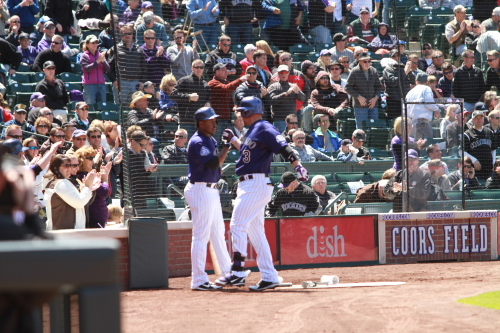 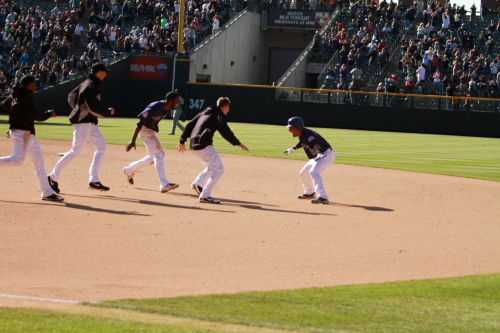 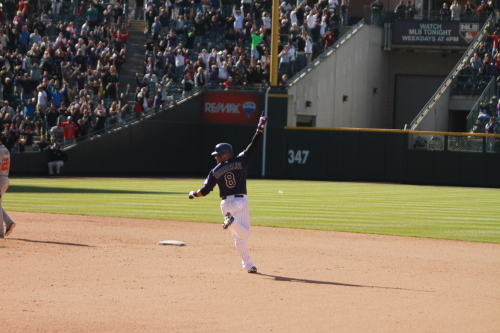 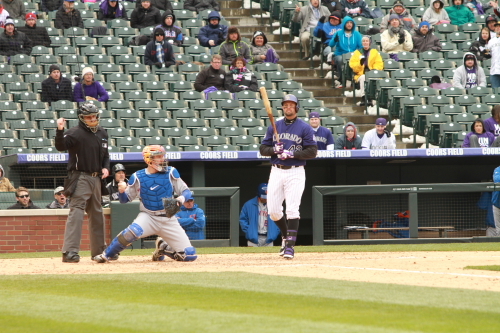 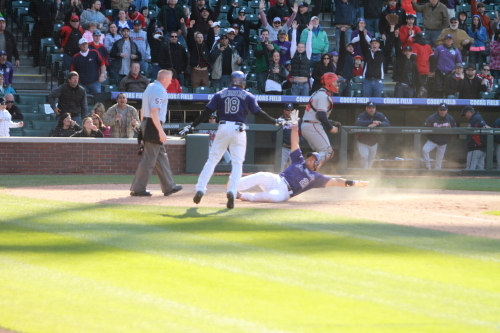 The Rockies would score 2 more on a Calos Gonzalez hit Eric Young Jr. and Pacheco both scored (3-0) Rox. 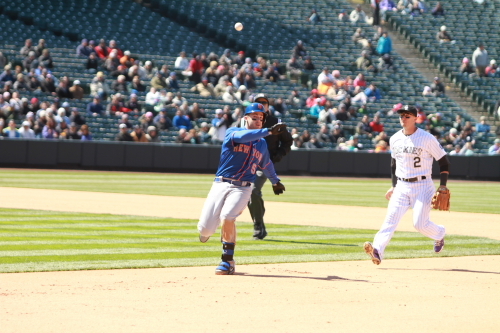 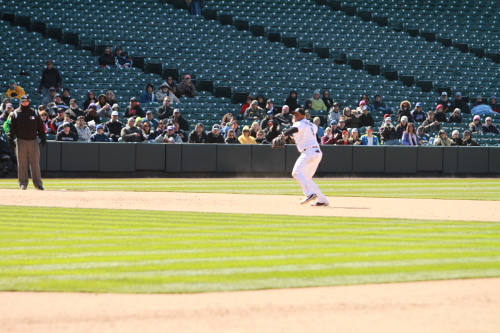 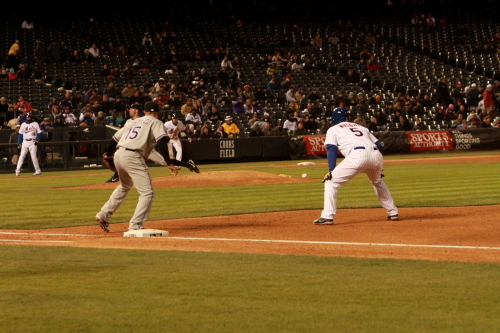 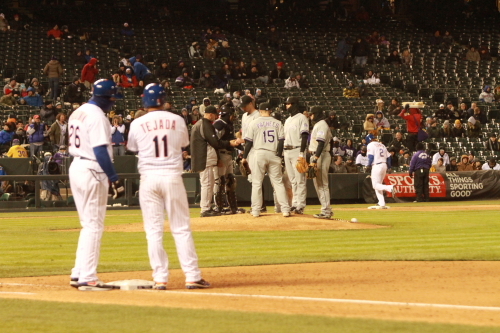 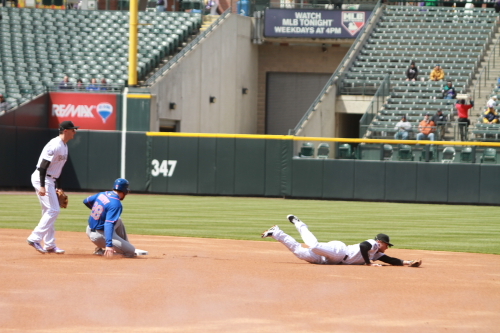 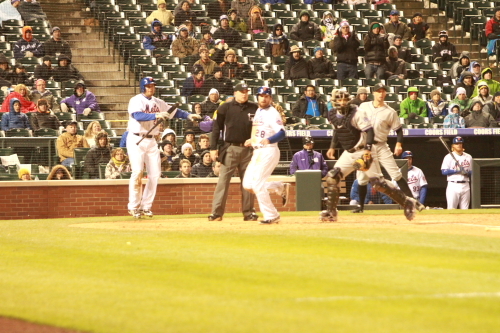 With Cargo on second Tulo doe the all too familiar pop up to an infielder. 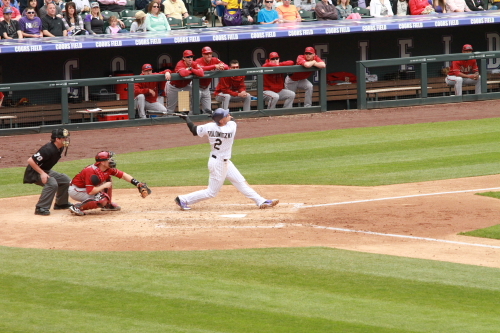 Only needed a single swings for the fences in my book that is another lost RBI for him that bring the total to 9 additional RBI’s that he could have had. 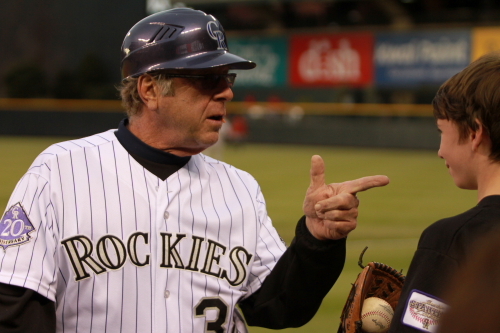 That would have him leading the National League with 26 instead of having 17 being 5th. 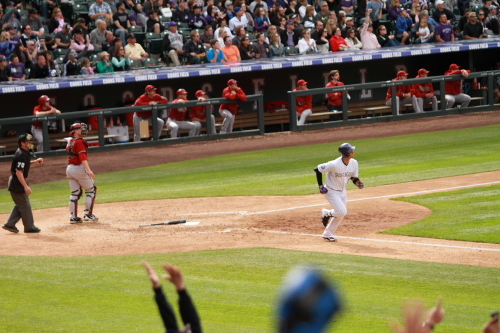 Just saying this is one of those situations that it would benefit the team if he wasn’t swinging for bad pitches and just was a little patient at the plate like when he hits home runs when the Rockies are up by 6! 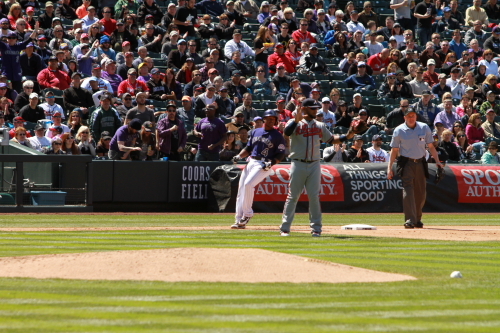 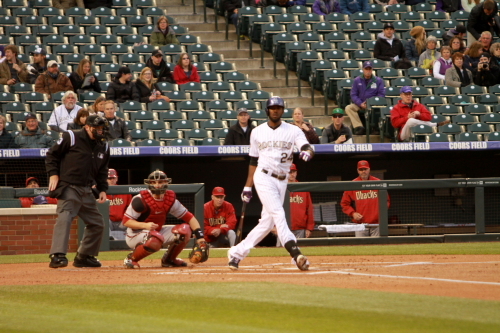 The D’backs score 2 in the 5th bringing the Rockies lead to only 1 run. 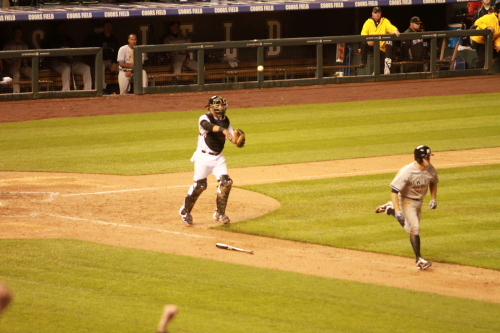 Now how important is clutch and timely hitting. 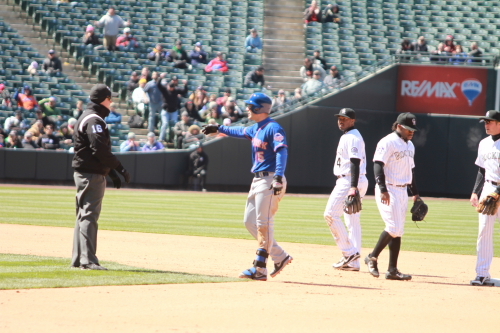 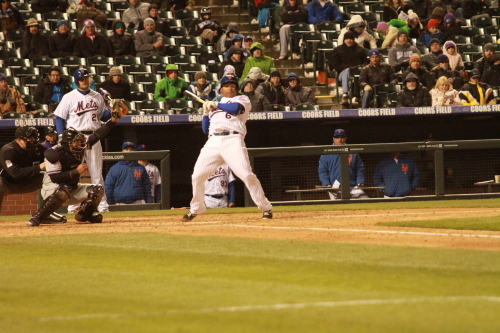 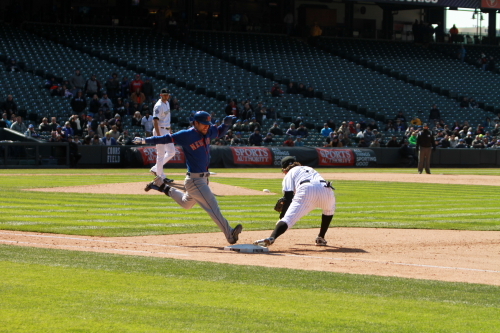 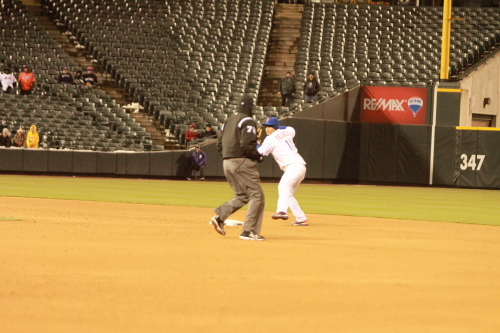 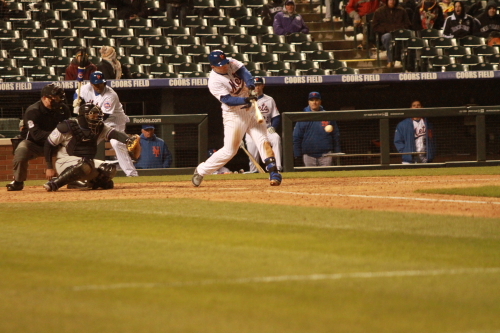 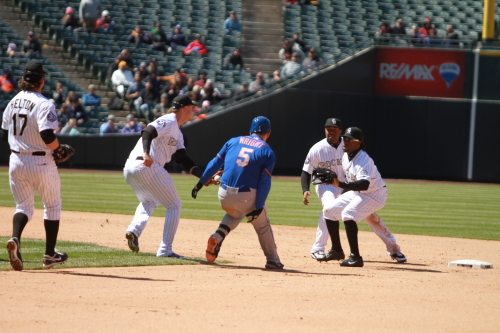 Rosario hit a sure double to center and tried to stretch it to a triple and was out at third. 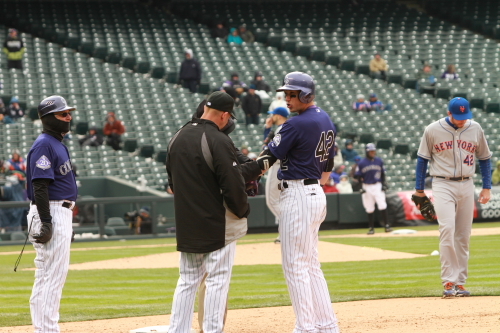 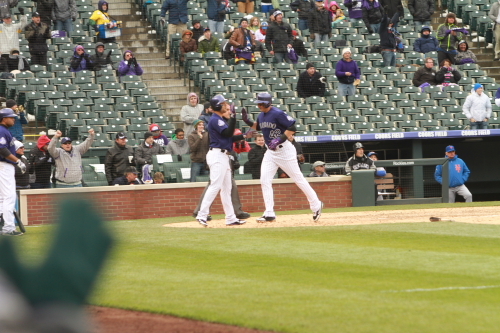 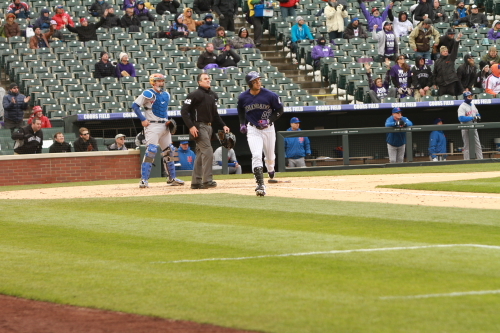 The Rockies Would get a 4th run in the 6th on a Tulo Home run. 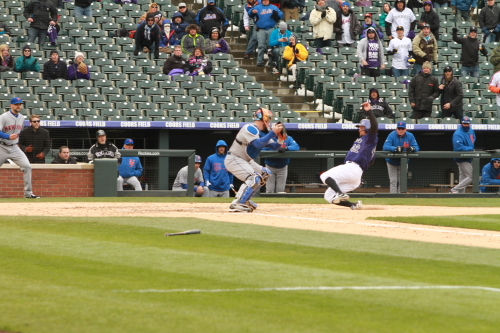 Yes it was a RBI and a homerun but it could of had been 2 RBI’s for the day and a 5-2 Lead. 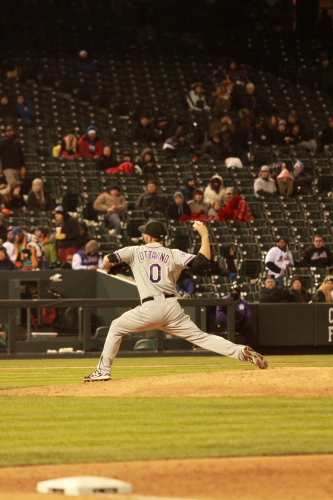 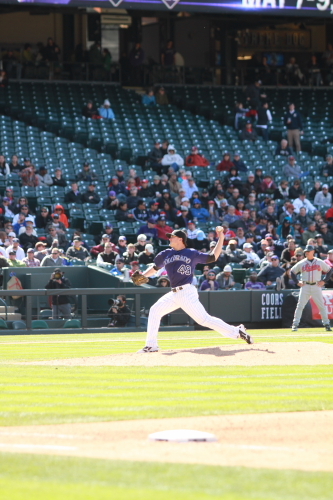 Adam “Brooklyn” Ottavino pitching in the 5th inning. 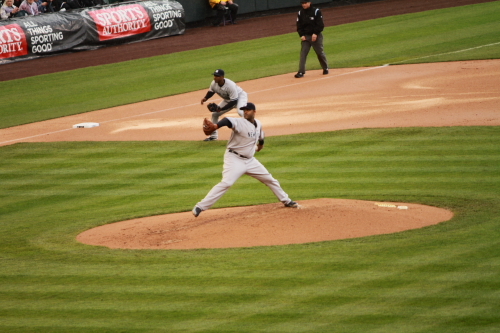 Nicasio pitched very well this game. 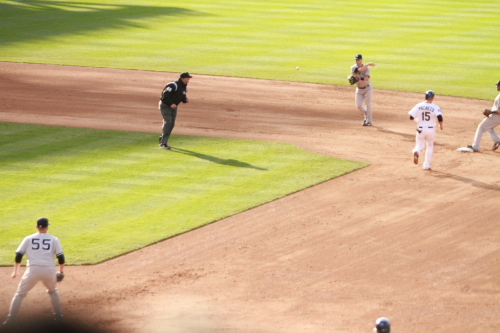 Only giving up 3 hits and 2 runs. 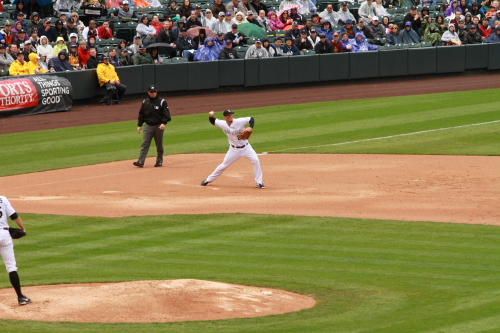 He Struck out 3 and walked 3. 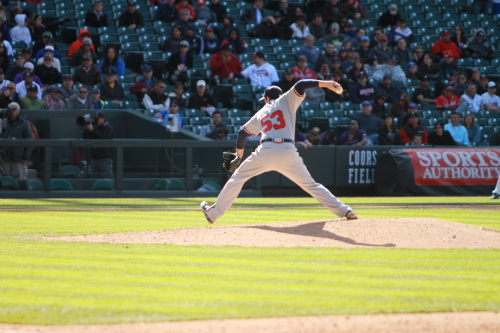 His pitch count was very high for his 4.1 innings throwing 95 pitches. 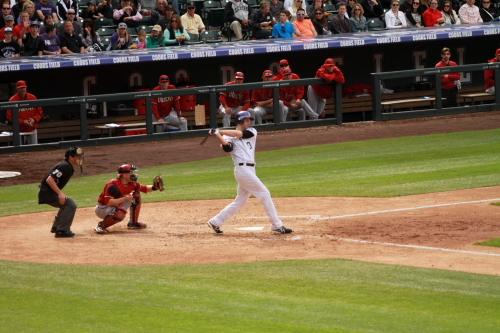 Including a 13 pitch at bat to Parra in the 3rd. 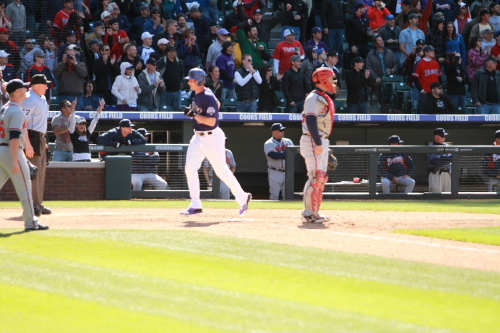 Adam Ottavino got to bat in the 5th. 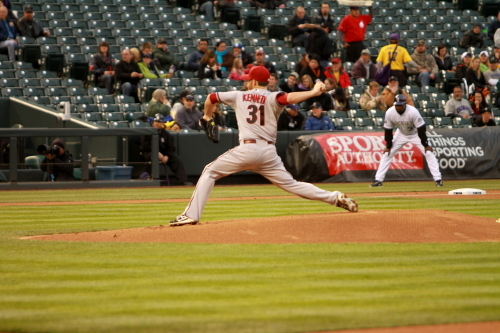 He did strike out. 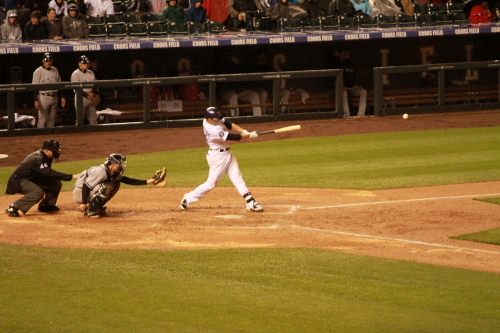 Many may not realize but he is a switch hitter and batted lefty for this at bat. 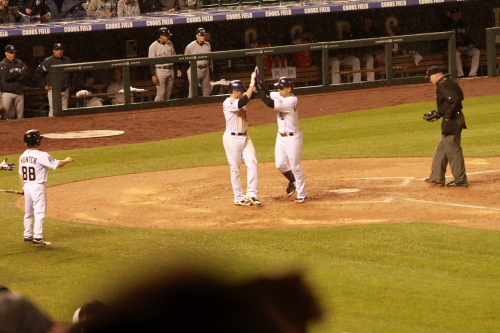 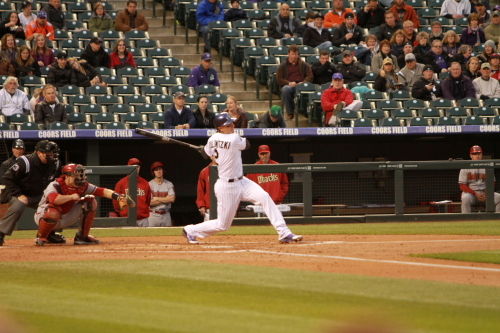 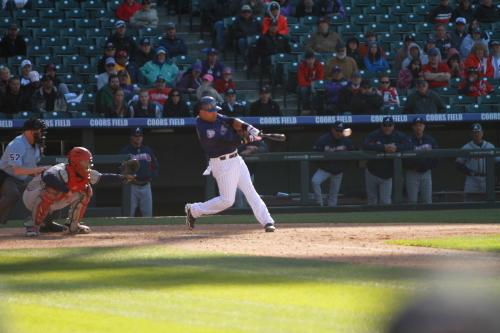 Cargo hits a long fly ball to center that was caught by A.J. 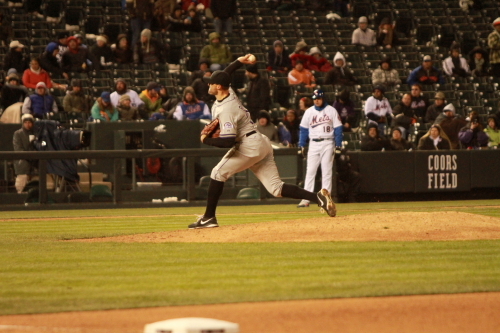 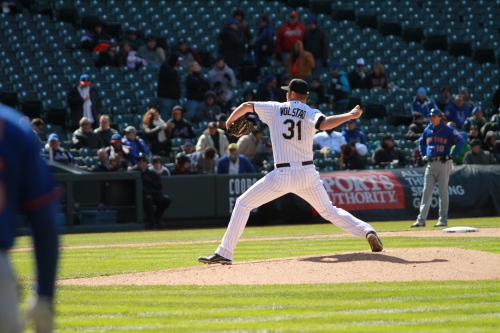 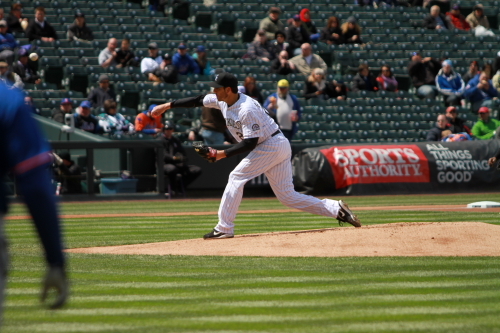 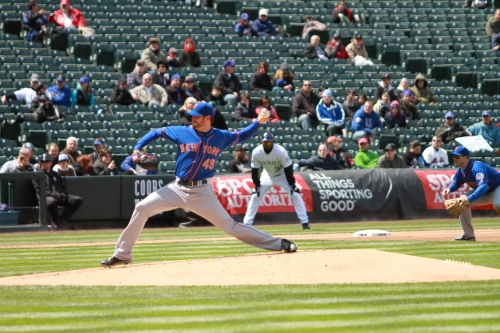 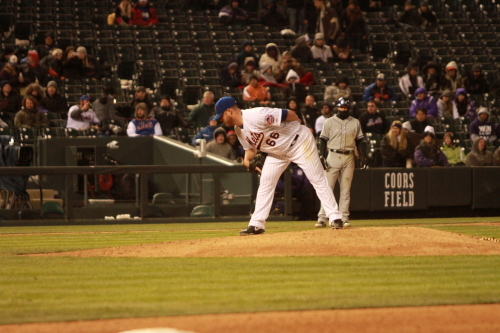 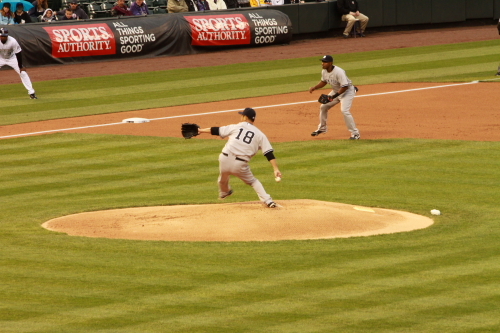 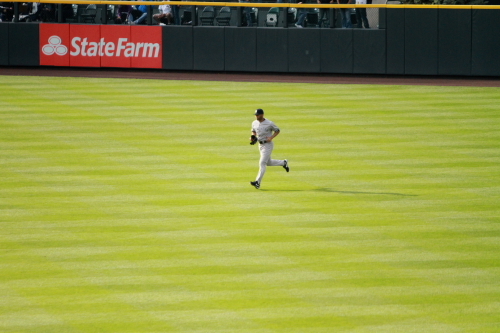 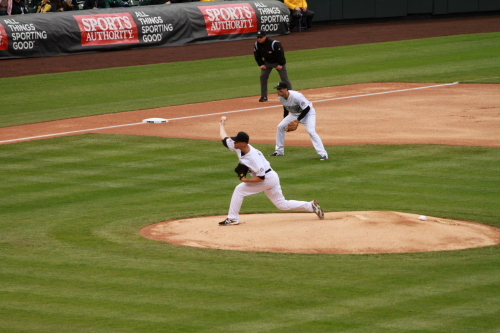 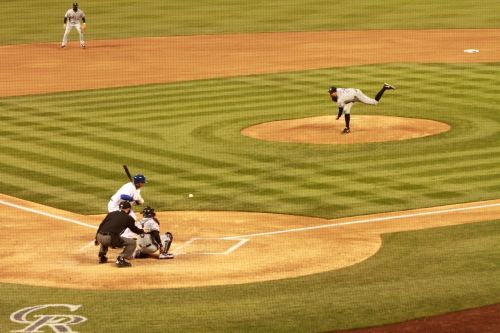 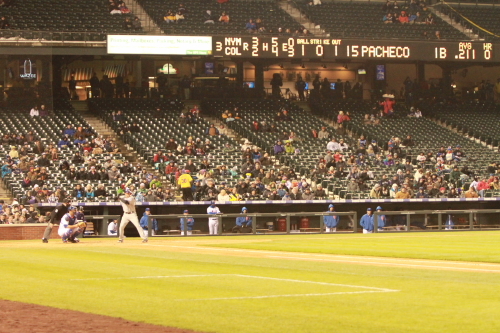 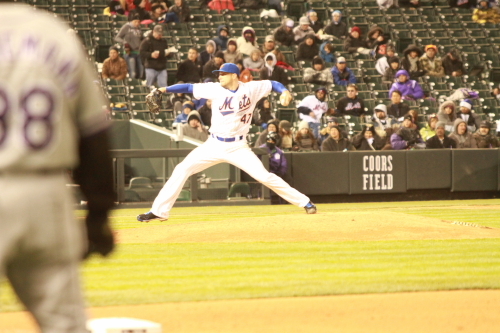 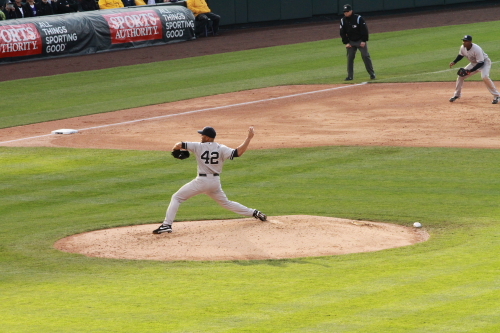 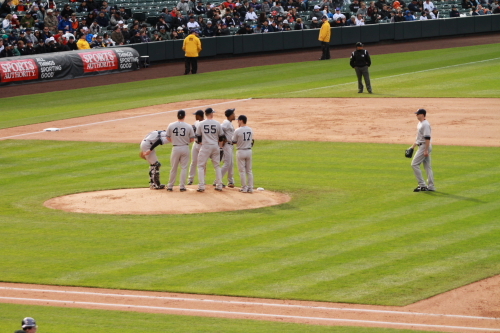 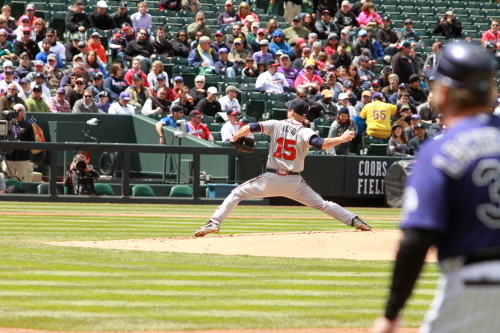 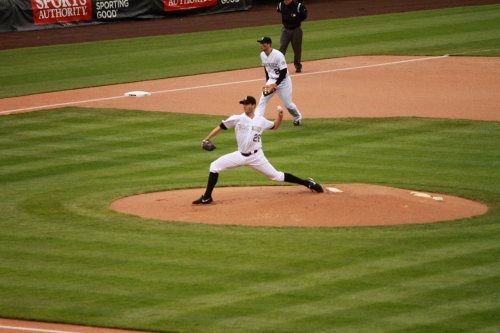 Pollack in the 5th inning. 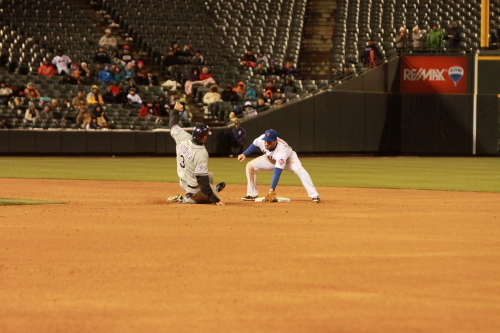 After a double switch in the Taking Chris Nelson out of game, moving Jonny Herrera to third and Rutledge to second. 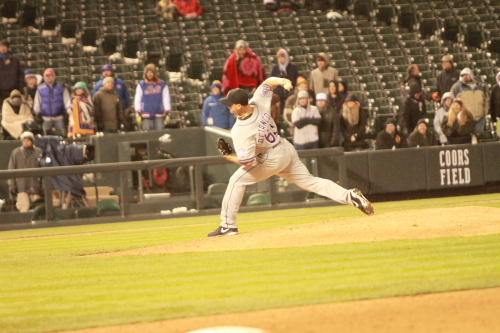 Josh Outman who had been called up from The Springs pitched 7th inning. 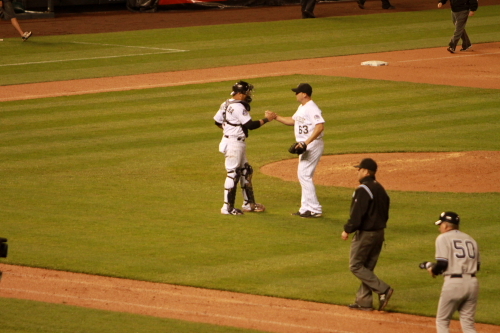 He would get the 2 batters out that he faced striking out Parra for the last out of the inning. 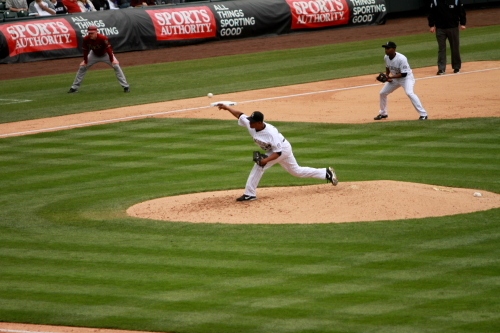 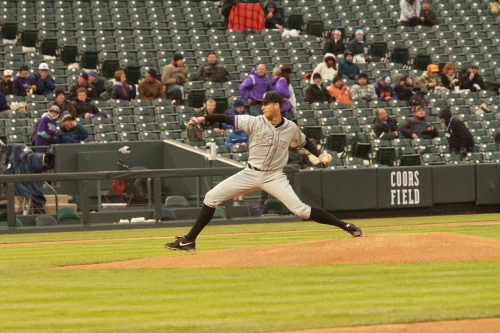 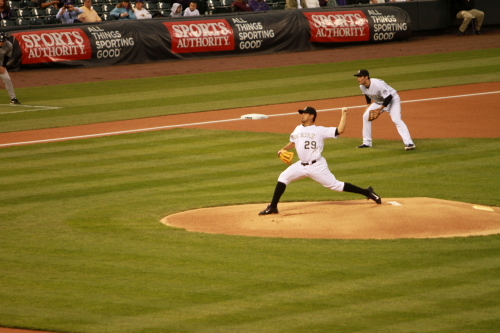 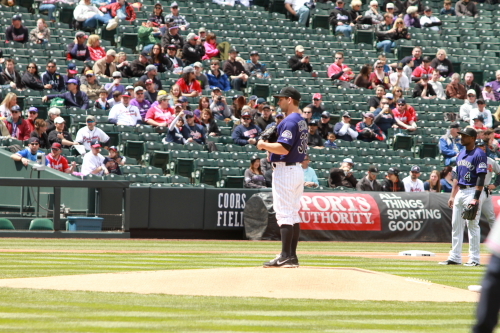 Former Rockies pitcher Matt Reynolds pitched the 7th inning for the Diamondback. 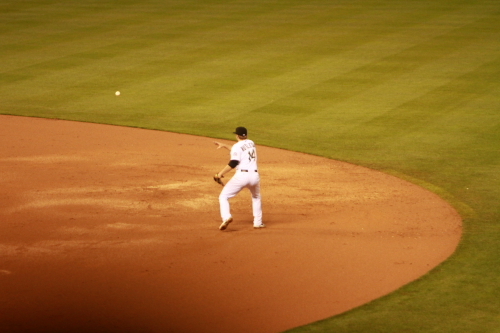 we have seen him a few times this weekend but this was his first appearance in a game for the D’backs in this series. 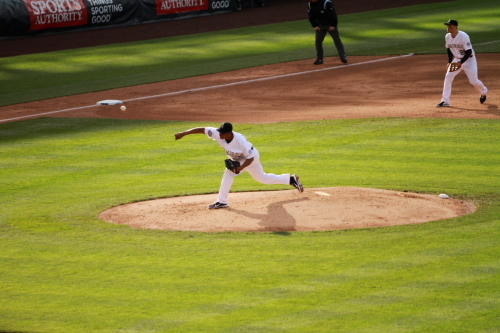 He got all 3 batters he faced out in the inning. 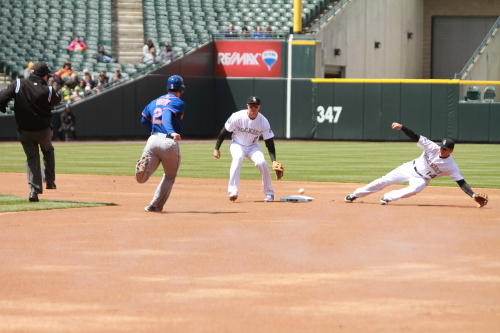 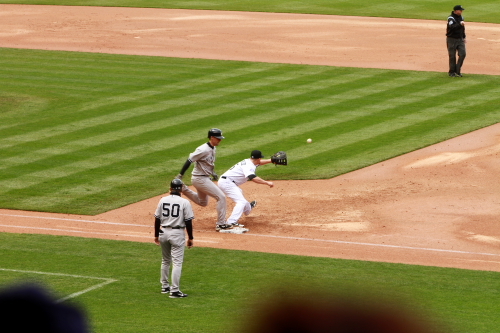 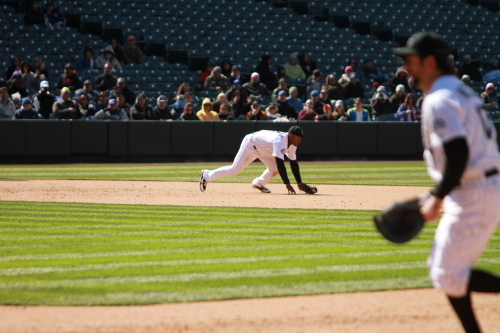 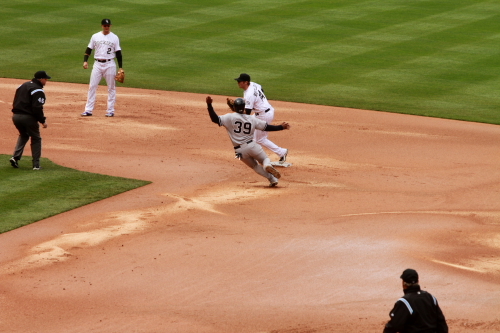 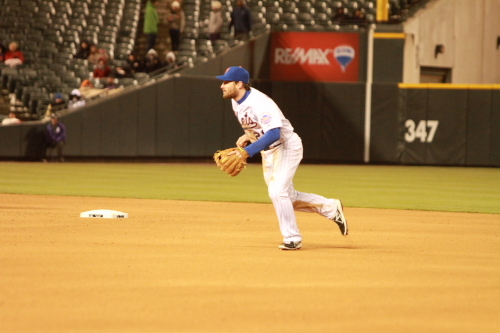 Here is Reynolds making a play and throwing to first on a EYJ ground ball back to him. 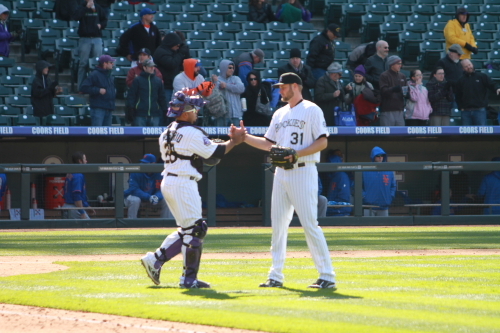 Wilton Lopez came in for the save in the 9th inning and lets just put it at he did not get it and the Rockies had their first home loss of the season. 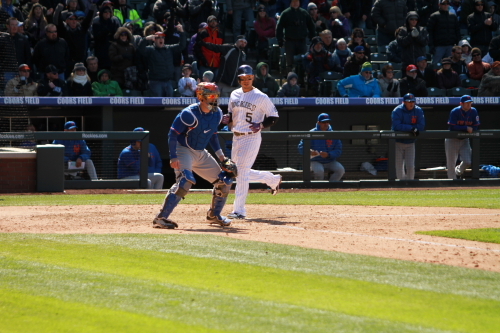 When he came in the Rockies only had a one run lead and they lost (5-4) Now how important would Cargo scoring on a Tulo single in the 3rd would of helped! 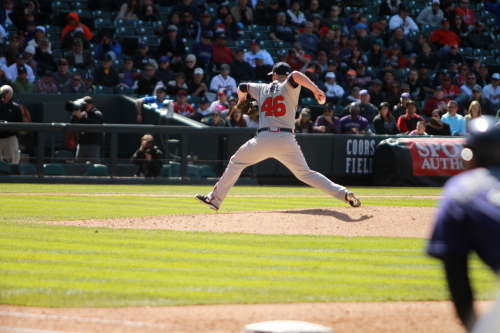 Here is A.J. 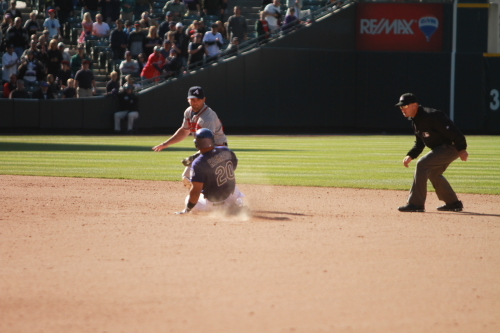 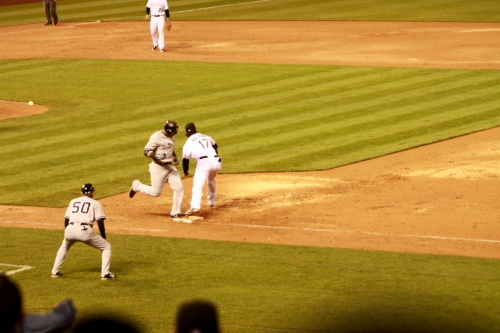 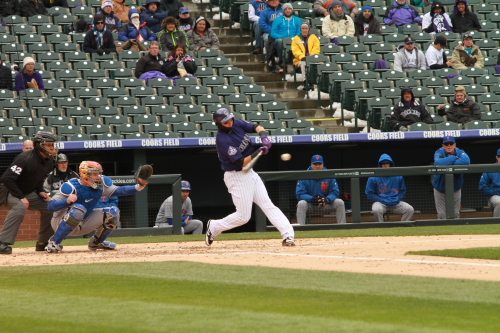 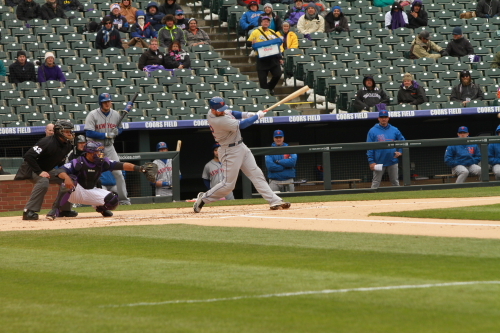 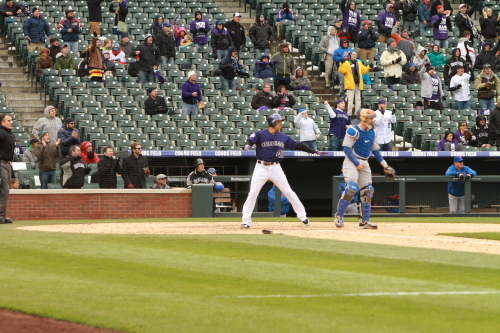 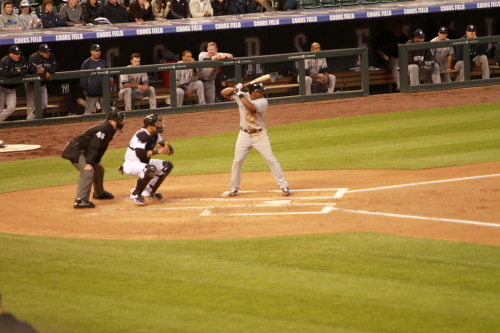 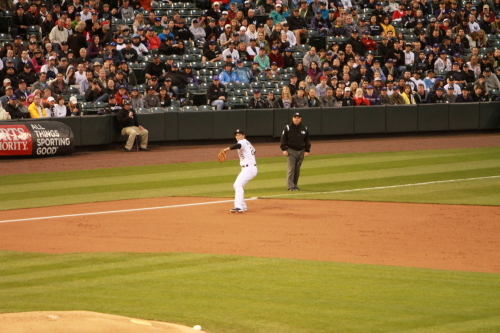 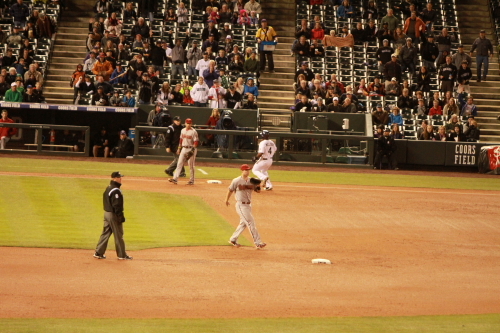 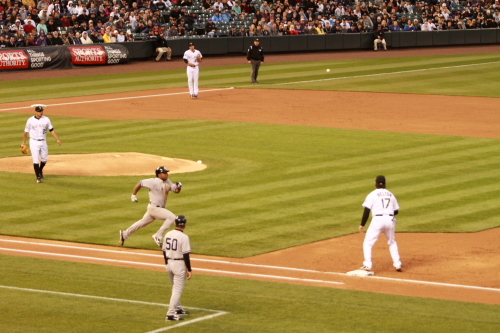 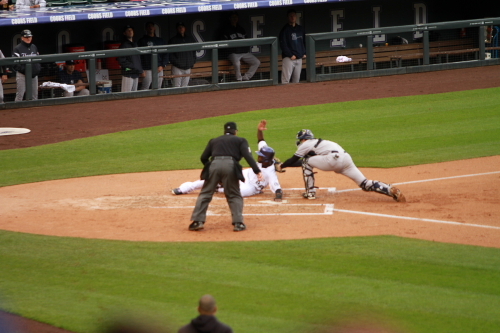 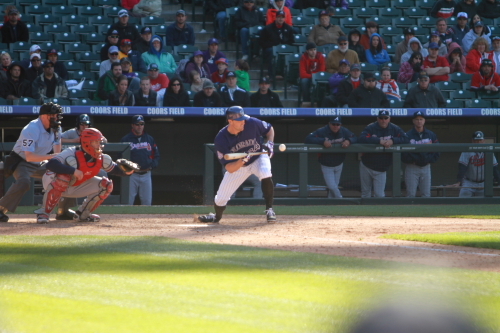 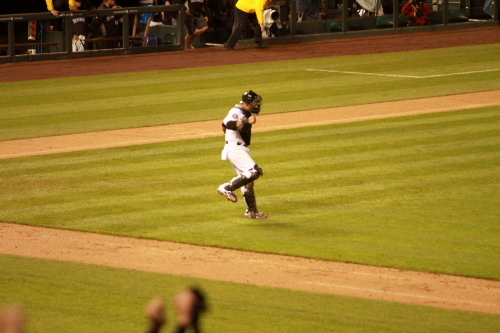 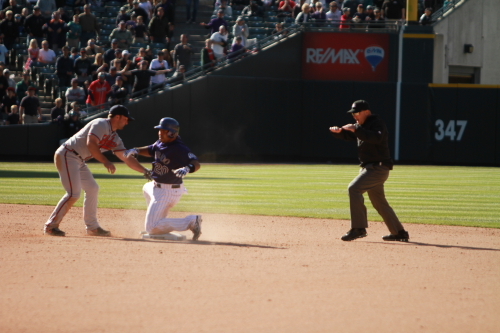 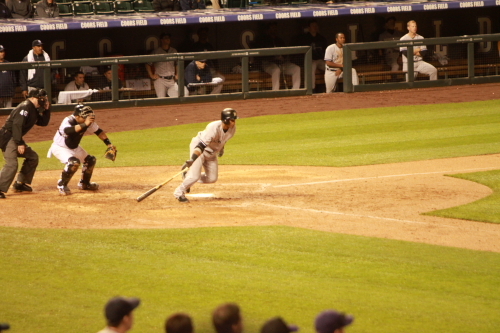 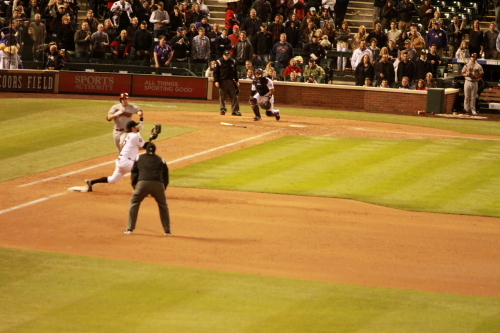 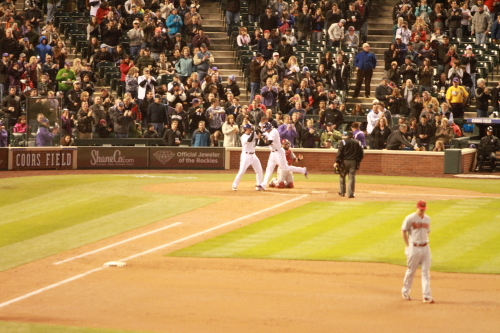 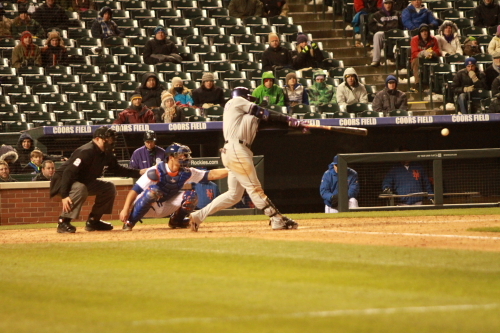 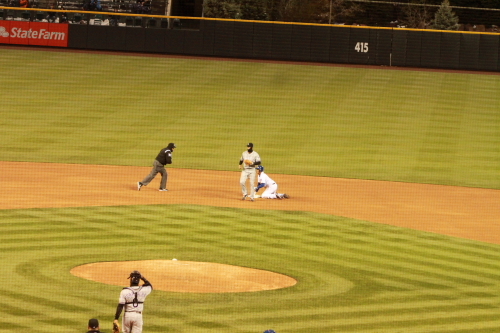 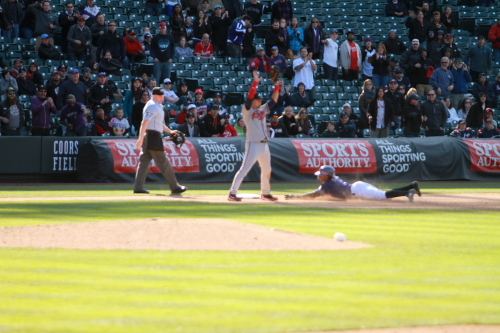 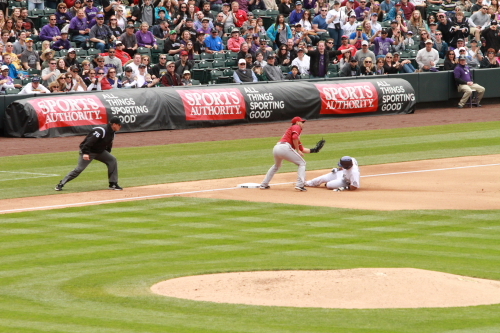 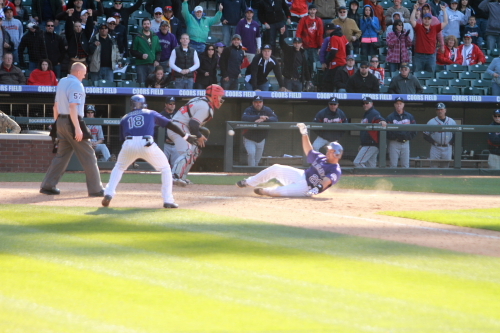 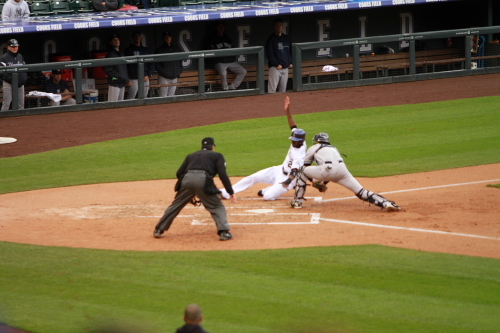 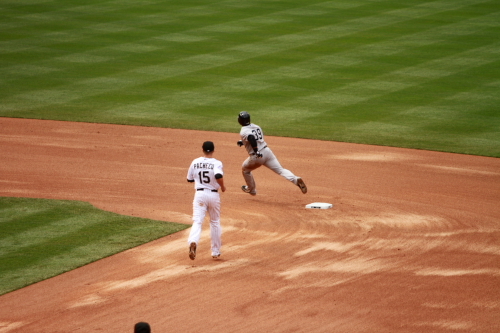 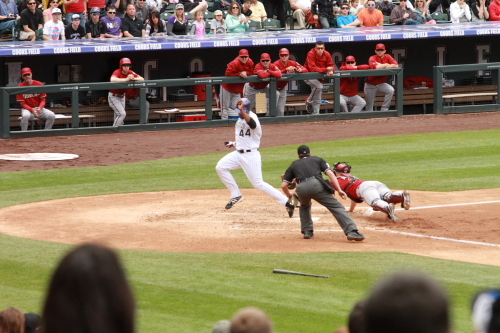 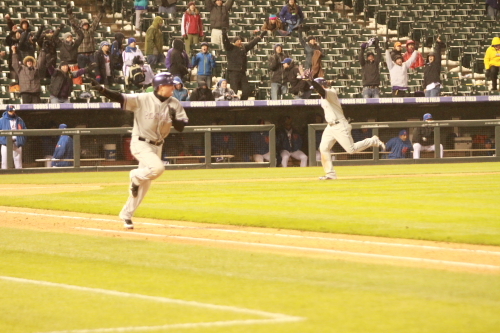 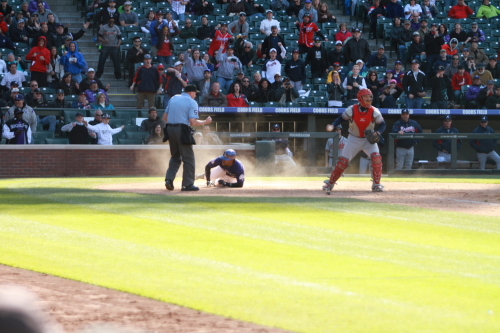 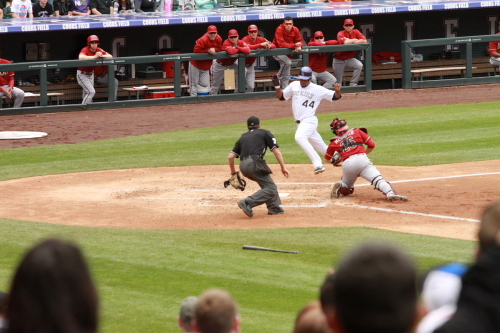 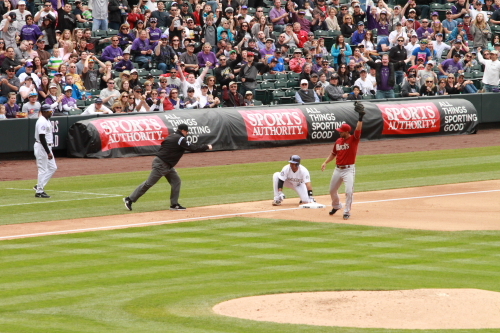 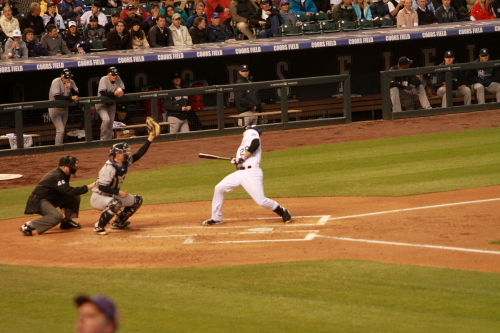 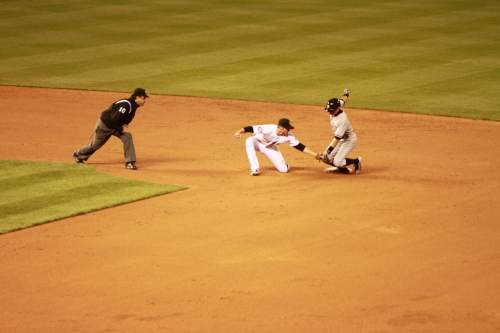 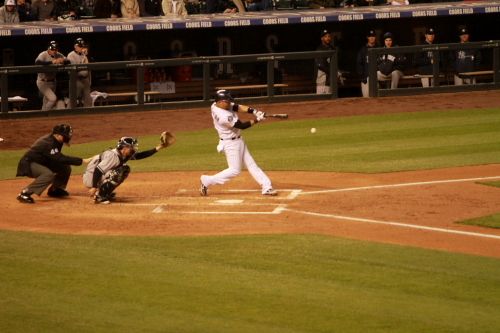 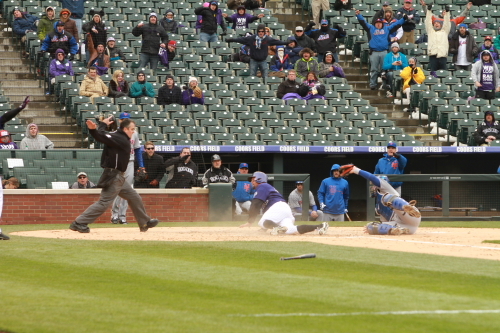 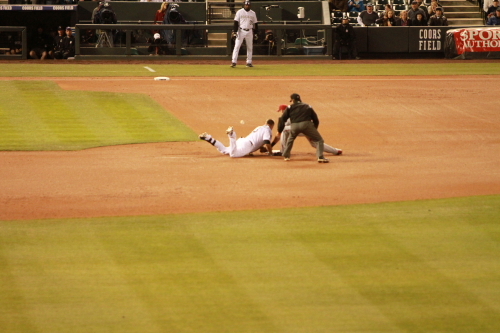 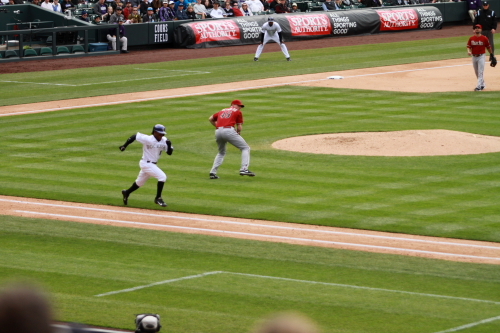 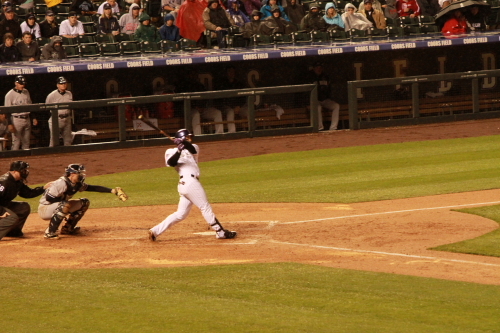 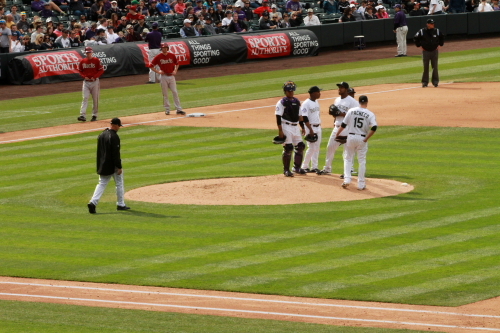 Pollack scoring the losing run for the Rockies. 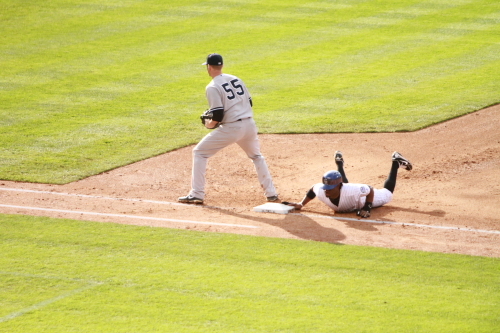 Didi Gregourious scored the tying run on a Pollack double. 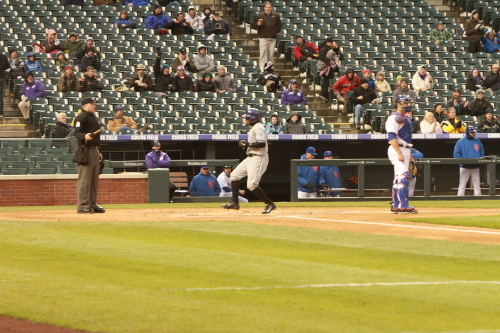 Dexter Fowler who walk as pinch hitter for the pitchers spot runs to third on a Josh Rutledge single. 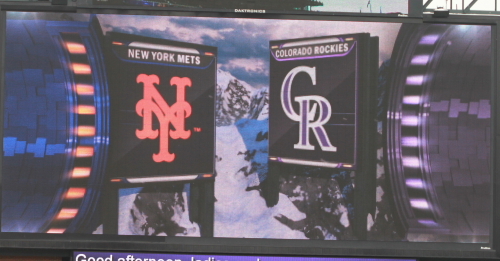 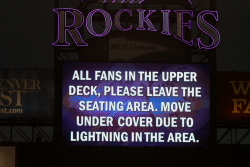 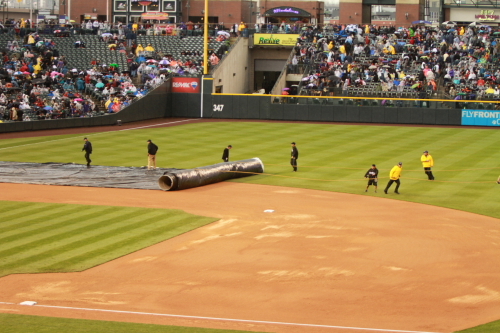 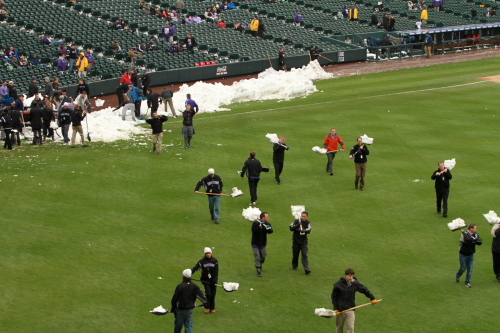 The Rockies did put up a fight, but were not able to come back on this one. 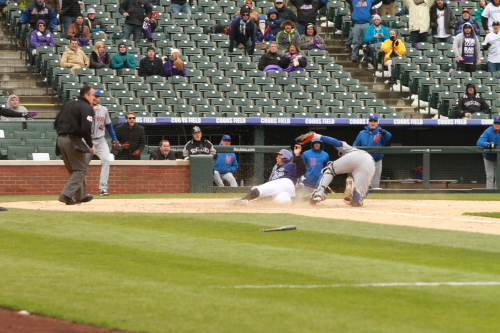 there was 2 out when Dex reached third. 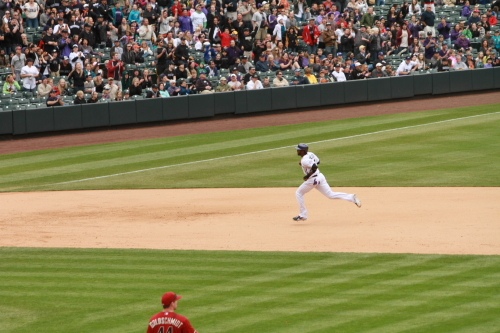 EYJ came up with Dex on third and Rutledge on first. 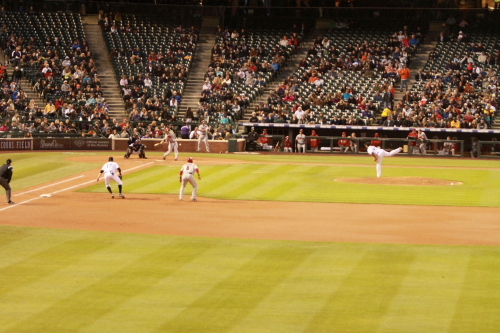 EYJ would ground out to Paul Goldschmidt at first to end the game. 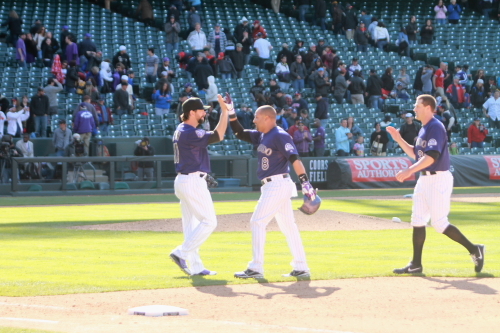 It was only 1 lose at home but it would have been great for the home streak to continue. 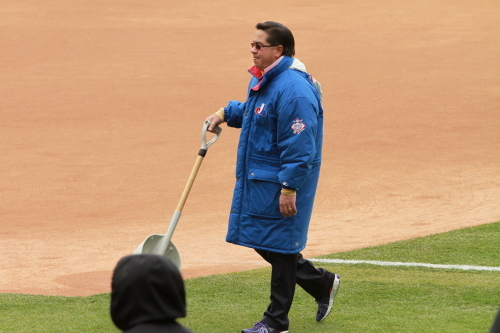 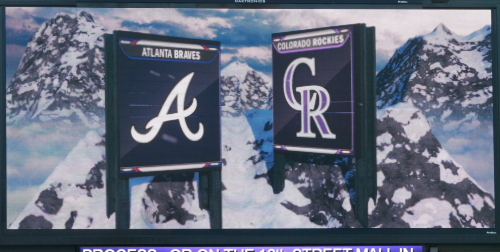 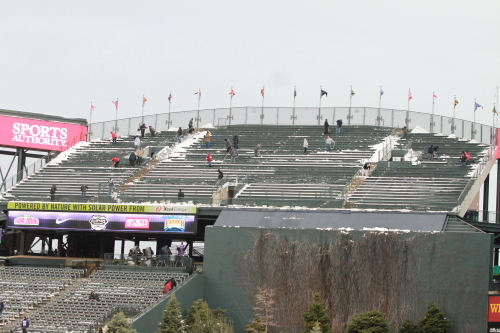 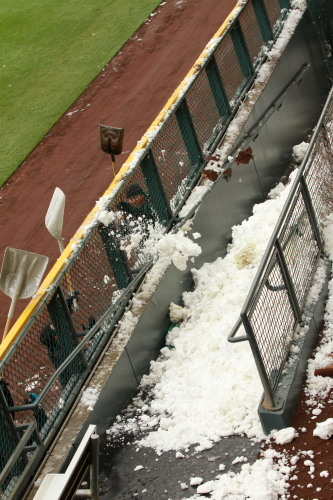 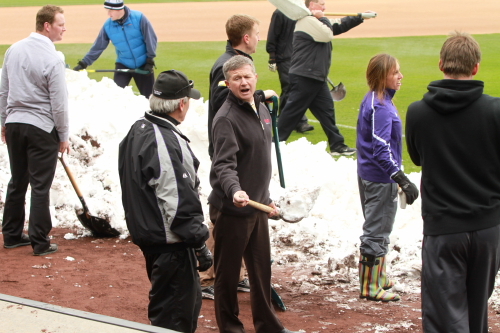 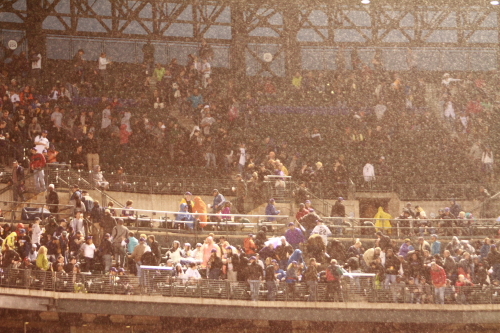 Well that is it for this one, I need to get ready for snow series2.0 against the Atlanta Braves! 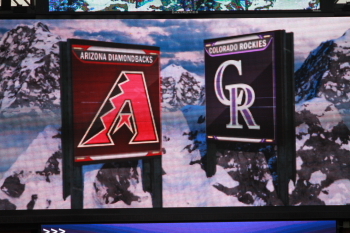 I will be there for all games that they can get in the next 2 days!